Today’s Weekly Photo Challenge asks us how we feel by the Sea. If you are a regular visitor you already know I spend as much time as possible by the water so for me the difficult part of this challenge was to select just a few photos. 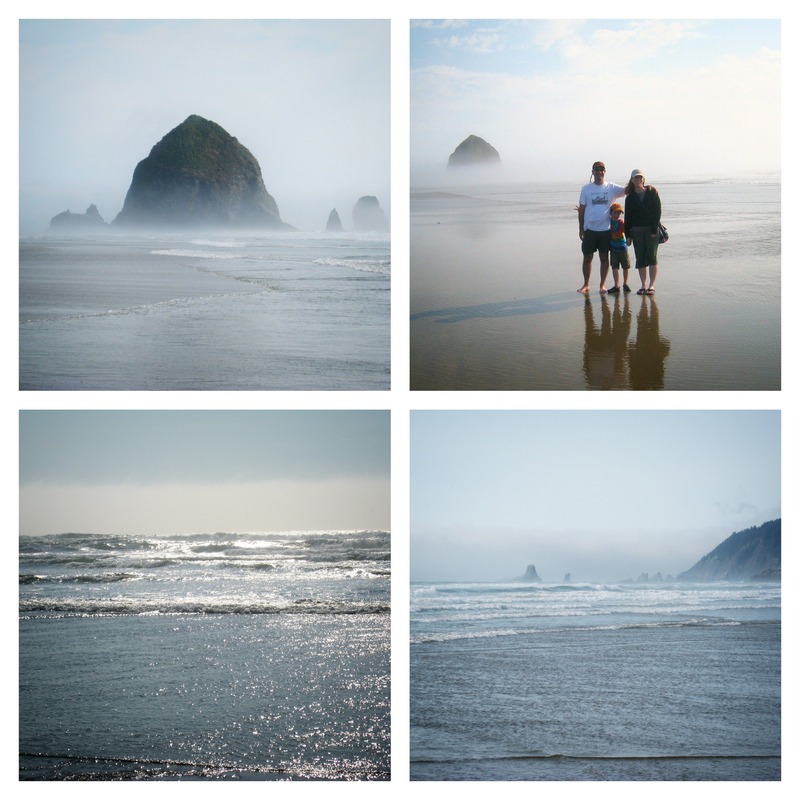 To narrow down my choices I decided to show you a fun, misty afternoon at Canon Beach on the Oregon Coast. This visit was in the late afternoon and the beach was surprisingly quiet. We had a great time splashing around in the shallow water pretending to surf the little waves and Ryan managed to slip a goofy expression or gesture into every picture we took as a family. The sound of waves crashing on a beach and the smell of salt water are two of my favorite things in the world and these sensations are at their peak on the coast. Our Puget Sound area has its share of beautiful coastlines but they are protected from the full force of the west wind by the Olympic Peninsula and the impact of stepping to the edge of the continent can’t be beat. Do I feel more peaceful at the beach? Yes! So do i! The beach has such a restorative effect for me (and all of us) too. ” . . . stepping to the edge of the continent can’t be beat.” That is a great line and so true. It feels like you’re on the edge of forever. Beautiful pictures. I love how the mist surrounds haystack rock. The beaches in Oregon are beautiful and more enjoyable than the beaches on the Northern California coast. As a little kid I was hit by a rogue wave. Never enjoyed that beach after that experience. Oh those rogue waves are so scary! The Northern California beaches are pretty but I do have to say I like the Oregon ones more too. Thankfully my dad was there to grab me before the wave took me too far. A truly scary experience. Gorgeous view of the Canon Beach! Beautiful captures. Thank you Amy. 🙂 I have posted all of my Oregon coast pictures now… It’s time for another trip! I am a former desert dweller, being born in Palm Springs. I have grown to see the ocean as a place of beauty but have respect for the strength of the water. I love camping on the Oregon coast. I like your insight Roberta, the oceans are definitely a mix of beauty and power and you have to respect the wildness while there. Yes, I think it is too. Some of my favorite places in the PacNW! Beautiful photography! I’m happy to hear you feel the same sense of peace. 🙂 I love being at the beach. Put me in the pot with the other satisfied readers – I’m so happy to be following your posts. Your photography is such a welcome visitor! Another hot and humid day in southern Indiana. Thanks for the instant beach vacation. Have a great Labor Day weekend. Oh – its so beautiful…and a little eerie with the mist.! Eerie is a good word! I always debate the question: mountains or ocean? Ideally: both! Love how much peace being by the ocean brings to my soul. Lovely pics Lisa! As a Iowan it was a VERY exciting thing to see the ocean for the first time. But I must say I was more overwhelmed by the Pacific ocean. Thanks for the post! lovely set of images… great take on the challenge ! Beautiful images! I love Canon Beach! Thanks – isn’t it a great beach! Gorgeous place, beautiful photos, and you do such a good job of explaining the difference between a “normal” coastline and Puget Sound. I really appreciate that! Thanks for letting me know! Our Puget Sound beaches feel so different from the open coast I wanted to share the feelings with people who have never had the pleasure of visiting them. Beautiful sea mist coming up to take advantage of.